If you have been on social media or have paid attention to anything college football related recently, you know exactly what I’m talking about. This post does not plan to have any factual statistics, but I just want to point out some common sense– the Michigan hype needs to come to an end already. This has nothing to do Michigan being overrated, in fact, they should have a solid team this season. But come on, let’s be real. This team does not deserve to be ranked in the pre-season top four. What has this Michigan team even done from last season to justify it? Sure, they whooped up on an overrated and depleted Florida team in their January bowl game. but they also lost their three most important regular season games last year. The Wolverines coughed up their season opener against Utah, lost in the most absurd way possible to Michigan State, and got their behinds handed to them at home to Ohio State. Michigan’s only “quality” wins last season were beating BYU and Northwestern, who both turned out to be just a tad overrated. Michigan returns several starters on both sides of the ball, but also has no quarterback still. John O’Korn was supposed to be the new-guy, but is in a three-way battle for the position now. The Wolverines do play a joke of a schedule early on, as they do not even leave the state of Michigan until October. I still have no idea how they got away with that. I honestly do not think you can play a more pathetic non-conference schedule. Hawaii is not a good team, UCF literally lost every game last season, and Colorado has been an embarrassment for the last ten years. The losses will come one way or another, with road contests at MSU, Iowa, and Ohio State. There is just no plausible way Michigan doesn’t drop at least two of those games. Look, Harbaugh is a complete nut-case, but he is a brilliant coach. Michigan will win at least nine or 10 games this coming season. They will obviously be good, but they will not be playing in the College Football Playoff, and will probably be nowhere too close to it by the season’s end. Down the road, Michigan will be playing for a national title. Just not this year. As for now, MSU and Ohio State are still the class of the Big Ten. There are too many question marks on this UM team to start claiming them Big Ten favorites and national title contenders. After Saturday’s games, you can honestly sit here and make the argument that there are no dominant teams in college football. I think that it will eventually play itself out and we will see four much deserving teams advance into the playoff. But for right now, things most certainly do look shaky. Ohio State and Michigan State have struggled greatly recently. The Buckeyes defense is very talented, and for the most part has played exceptionally well, but outside of Ezekiel Elliot on offense, the Buckeyes have several question marks including the new-named starter Cardale Jones. Jones has made good throws every now and then, but still looks uncomfortable when his first option is not there and he has to evade the pocket. Indiana nearly and probably should have beat Ohio State yesterday, but then again it is Indiana, and they of course coughed that game up worse than a hospital patient with pneumonia. Michigan State is hard to predict this year. While the Spartans have remained unscathed at 5-0, they also have had several close calls in the 4th quarter to teams who are bad. The Oregon win is great and all, but Utah beat the Ducks by 42, and there is no legitimate reason to ever get out-gained by both Central Michigan and Purdue, even if all of Sparty’s defense looked practically hungover. MSU needs to finish games stronger, and quit playing conservative after they build a large lead. 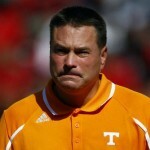 Seriously, your pushing toward Butch Jones territory with that non-sense, and that is one place no man ever dreams to be. Ole Miss essentially proved that they are a one-hit wonder, who will likely fade into the sunset with an 8-4 record. After the big win over Alabama, people were proclaiming the Rebels to be the class of the SEC. The win was in my mind a fluke, and it’s really starting to show. Beating a barely division one caliber Vanderbilt team by only eleven at home, and then getting man-handled in the Swamp to Florida pretty much proves my point. See ya later Ole Miss. TCU and Baylor both looked good yesterday, but come on let’s be real; nobody plays any defense in the Big 12. You don’t even have to watch these games. Just play NCAA football with a friend on XBOX and whatever your final score is, is probably pretty close to some of these absurd final scores. Baylor’s offense is good, but it is not 70 points a game good, and they haven’t played anyone who’s defense could stop some high school offenses. Let’s just pump the brakes on the Bears for now. Notre Dame has done a pretty good job coping with the losses of Malik Zaire and Tarean Folston, but the Irish couldn’t overcome Clemson’s big lead and a monsoon of rain last night. Deshone Kizer played well, but it’s really hard to blame anyone with how hard it was raining last night. There were a lot of dropped passes on both sides, but hey that’s what gloves are for right? UCLA might as well had not shown up at all last night. The Bruins couldn’t afford to lose to Arizona State, but Jim Mora’s players apparently should have gone to class more this week. It was a home game, why were his players out of class for six straight days? Anyways, UCLA is a young talented team, but more losses seem to be on the way when it’s all said and done. UCLA is the west coast Clemson essentially. Georgia without a doubt is the most embarrassing and pathetic performance of the weekend. For a team who was supposed to be “back” and make a national championship run, they looked like they didn’t even belong on the same field with Alabama. 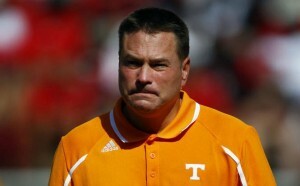 And well to be quite frank, they didn’t belong on the same field as the Crimson Tide. Bama completely outmatched and outclassed Georgia in every single way possible. Greyson Lambert was so bad at quarterback, that Mark Richt was forced to go to Brice Ramsey, who may have been even worse. Come on Georgia, learn how to do that quarterback stuff. For a program that has never been able to get over the hump with Richt at the helm, should anyone really be surprised that the Bulldogs lost? 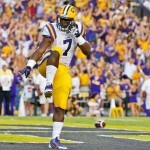 Finally, the one bright spot of the top ten, LSU. The Tigers may not even be in the playoffs when the season is over, but Leonard Fournette is truly special. He will be making big bucks in two years. What’s more crazy? The numbers that Fournette is already putting up, or the fact that he still has to return to Baton Rouge next year for one more season before being eligible to enter the NFL Draft? I’ll go with the latter. Fournette could be effective in the NFL already. Let’s just hope he doesn’t suffer any serious injuries, and let’s enjoy the magic that he continues to bring week in and out. So there you have it, nobody is good. The best teams in the country might be sitting outside of the top ten at the moment actually. Every team has some sort of petty flaw, but that doesn’t mean this season won’t be one to remember. With no dominant team, the chase for the playoffs is going to be one hectic finish. Also, great win over BYE this week Utah. They are a tricky opponent, good job. Ah, the glory days for the Texas Longhorns. Not sure we will see anything like this in Austin ever again. Two of the all-time greats. In the span of one week, we have seen (allegedly) two Florida State University football players being involved in a conflict with a woman. And by conflict, I mean, striking a woman straight in the face multiple times. This is obviously not good to ever hear this kind of news, regardless of who and where it was. Backup quarterback DeAndre Johnson’s situation was awful, because not only did he drill a woman straight in the face, but it was also caught on video for the entire world to see. 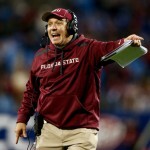 Shortly after news broke out, Jimbo Fisher made a pretty easy call by dismissing Johnson from the FSU football program. It’s not like this was a difficult decision for Fisher though, so let’s not go out and start praising him for making a decision every single coach in the country would have made. This debacle happened on video, and it’s not like Johnson was ever going to see the field anytime soon, so it was indeed a simple call. The other situation (allegedly) involved star running back Dalvin Cook. Now this becomes a very interesting situation for Coach Jimbo Fisher. Cook is arguably the best returning starter on offense, as he led the Seminoles in rushing last year as a true freshmen. This will be extremely intriguing to see what Fisher does with disciplining Cook. He decided yesterday to suspend him from workouts with the team indefinitely. Before we do jump to conclusions and start pointing the guilty finger at Dalvin Cook (ESPN), I am actually going to give Cook the benefit of the doubt until he is proven guilty. Now obviously, if Cook did indeed hit the woman multiple times, he should be kicked off the team. I do not think anyone is disregarding this. The interesting thing regarding this case though, is that it took place eighteen days ago from today, and still no charges have been filed. However, there has been a warrant issued for the arrest of Dalvin Cook from the Tallahassee Police Department. The only problem that I do have with this entire situation, is that all of the media outlets are posting this story everywhere. I do not know about you, but technically this kid is still innocent! I mean even if this case is completely true, it is still to early to start posting a story about a kid who will have to live with the name tag “woman beater” for the rest of his life, especially if he did not actually do it. I find it funny how on ESPN we do not see any stories about other players getting arrested from other conferences (SEC), but once anything is reported about a FSU player it is on the front page. Seriously though, how can all of this news break in one week? One week? Come on Jimbo! Take control of your program for crying out loud. We all know you are one of the best coaches in college football, but over the past two years FSU’s reputation as a university has taken a serious hit. Most people consider FSU’s discipline program to be a joke, and laughed at the entire Jameis Winston situation as it unfolded. Depending on the ultimate outcome of the situation, we will see everything that we really need to ever know about Jimbo Fisher. If Cook is guilty, he should be gone, and if Fisher only suspends him for Texas State and Chattanooga, well then, I guess everyone out there is right about Jimbo Fisher. 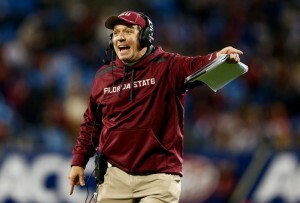 So I only have one question and one question only for Coach Fisher: Will the real Jimbo Fisher please stand up? Obviously something in the program’s culture needs to change quickly. Winning is not everything, and hopefully this situation gets resolved in a timely and proper manner. Everett Golson is coming to Tallahassee and is the ultimate wild card for the Seminoles in 2015. Florida State is returning several talented players, but they also lost key players who went 27-1 over the course of the past two seasons, and brought a national title back home in 2013. The offense will be interesting without Rashad Greene, Nick O’Leary. and of course Jameis Winston. However, with Golson FSU has a chance to make some noise next year. With a rather light schedule, a double digit win season is definitely possible, and if Golson can come in and learn the playbook and perform on the field, the Noles could be a decent team. Golson struggled severely toward the end of last year with his former team Notre Dame. He was incredibly inconsistent last year, and threw way too many interceptions. In fact, he actually led college football with the most interceptions last year. That is most certainly not something that you want to be on top of the standings for. If I had to bet on it, it looked like he truly lost his confidence altogether. Not to mention, Golson also lost his starting job in the final game of last season at the Music City Bowl in Nashville against LSU. We have seen Golson make plays before. He can be consistent. Maybe a change of scenery is what the mobile and agile graduate quarterback needs. If anything, he can definitely rely on Jimbo Fisher to help him improve his game. Fisher has been incredible in building his quarterbacks’ game and confidence over the years. What he did with Jameis Winston cannot go unnoticed either. The starting job is not exactly Golson’s just yet. He will be in a battle all summer long against Sean Maguire for the starting job. Golson can win this position, but he will have to prove his consistency and cut down on the interceptions. Florida State is going to be a young team on offense next year, and Golson cannot afford to make costly mistakes, when his receivers are going to have just enough trouble catching the ball and being on the same page with him. Regardless, its a win-win situation for Golson, who has nothing to lose, and he can easily become the 2015 starting quarterback for the Florida State Seminoles in 2015. Well it’s finally official. 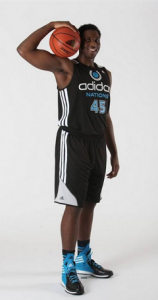 Caleb Swanigan has committed to Purdue. Now this is a big pickup for Purdue, who arguably had one of the best signing classes, just based off of Swanigan. Swanigan, who originally committed to Michigan State University, decided to go where his heart told him. And by heart I mean his legal guardian and everyone else pressuring him into going to West Lafayette. In all seriousness, I honestly think that Swanigan really did not know what he wanted, and decided to commit just to commit ealry on. While I have absolutely nothing against Swanigan, I can see why fellow Michigan State fans are upset about the whole ordeal. Who knows, maybe this is all karma from when Branden Dawson left Purdue and Painter in the dust for Izzo a few years ago. Purdue is going to have plenty of size next year, and will be a major force in the Big Ten and possibly on the national scene. AJ Hammons and Isaac Haas return and they are both solid 7-foot centers who have plenty of room and potential to still grow. Bringing in Caleb Swanigan is huge, because Purdue will be able to play at least two big’s on the floor at the same time. The biggest test for Purdue will be their outside shooting and guard play. Losing Raphael Davis is a key loss, but the Boilermakers are bringing in two four star guards to possibly help this problem for next year. The Boilers have a legitimate shot at winning the conference next year, but a top 5 finish in the conference should be expected. However, Matt Painter has shown in the past that he can coach talent and bring in a boatload of wins. The big man Swanigan is the real deal down low in the post. He has excellent size, and can will his way to the basket. On the plus side, he can knock down a sweet mid range shot from the corners rather consistently. The 275 lb. beast can do it all on the floor as long as he has the ball. It’s already crazy to think how good Purdue will be down low with the addition of Swanigan. The Wildcats lose seven players to the 2015 NBA draft. John Calipari knows how to properly rebuild and reload talent in Lexington year after year, but this year could be different. As we saw in 2012, the year after Kentucky won the national championship, the Cats had a tough season with injuries and failed recruits who didn’t maximize their potential as highly rated recruits. That season ended in full disaster mode with a loss in the first round of the NIT against Robert Morris. The bad news is next year could be something close to that. I say this with not a whole lot of confidence because the Wildcats are bringing in 3 solid recruits. Charles Matthews at point guard, Isaiah Briscoe at shooting guard, and Skal Labissiere. Tyler Ulis, Marcus Lee, and Alex Poythress also return for Kentucky. The reason for a possible down year is the loss of all the experience and talent from last year’s team that won 38 straight games. Another reason is due to the Wildcats missing out on several of the top recruits in this years class. Brandon Ingram committed to Duke, Malik Newman went to Mississippi State, Caleb Swanigan committed to Michigan State, and Ivan Rabb committed to Cal-Berkeley over UK. Jaelyn Brown and Thon Maker are still on the board for Calipari to snag. If the Cats get one or even both they will definitely be fine for next season. Duke’s 2015 recruiting class continues to get better and better. 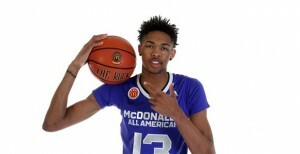 Brandon Ingram decided to commit to Duke University last night. Ingram, the 6’8 forward was ranked #3 nationally on many recruiting websites. Ingram was heavily recruited by Coach K after the departure of Jahlil Okafor, Justise Winslow, and Tyus Jones. Coach K wasted no time convincing the star small forward to come to Durham. The Blue Devils will be young, but stacked next year. Top recruits Chase Jeter, Derryck Thornton, and Luke Kennard are all apart of the top ranked recruiting class in college basketball for 2015. Ingram said according to many reports that he didn’t want to sign with UNC due to the current academic scandal taking place in Chapel Hill.